If you have been to Haiti but never eat in the street, you have not discovered Haiti yet. What I mean is that you go over to a Street food vandor, also called Chin Janbe, and you get yourself a a nice plate of food. Being able to be in Haiti and have the freedom to explore Haiti's street food scene is priceless. 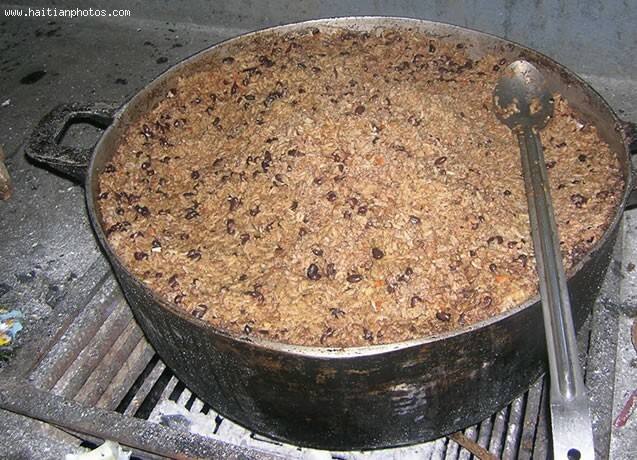 Discover favorite local dishes like Pwason (fish), Dire Kole ak Pwa (rice and red beans), and Sos Kreyol (creole sauce). 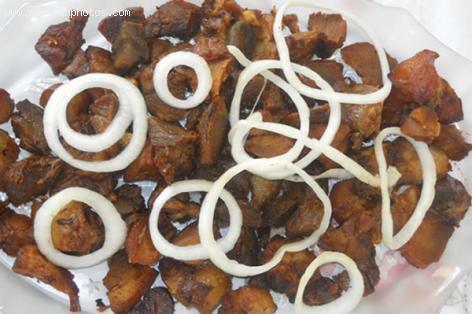 How about a nice Griot with Pikliz. I don't know what it is; however, these food cooked in the street usually taste a lot better than what I eat at home. 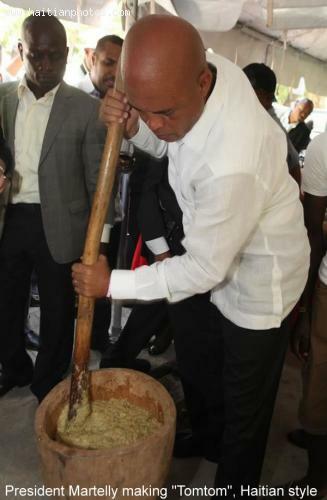 The Haitian President Michel Martelly is working on his next career. In this picture, he is having the ingredients for making Tomtom mashed in a "pilon." 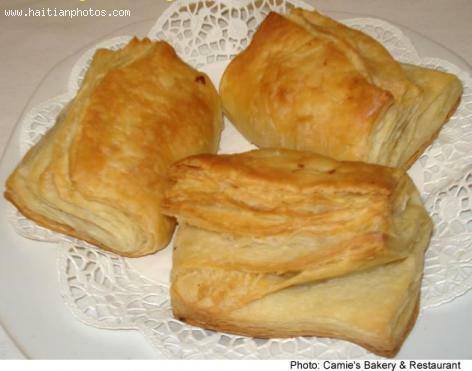 The regional dish Tomtom is unique to Jérémie and the Grand'Anse Department of Haiti. It is made of steamed breadfruit (lam veritab) mashed. One very important aspect of this dish is that you can't chew it. Tomtom is made into round balls and swallowed with a sauce made of okra (kalalou, Gombo) cooked with meat, fish, crab, and spices. 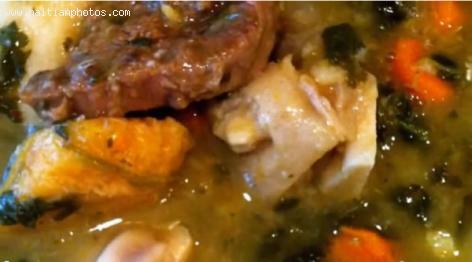 Haitian Boillion is a hearty Haitian soup that is as tasty as it is wholesome. The cooking time is long, but the steps are so easy and low-maintenance it will prove a wonderful addition to your repertoire. 1. Make paste with the hot pepper, garlic, parsley and shallots. 2. Season cooked meat with seasoning paste and broth. 3. Cook for ten minutes over medium heat in covered pot while stirring constantly. 4. When all the liquid has been cooked off the filling will be ready. 5. In large mixing bowl, add flour and make a hole in its center. Into the hole pour water and add the salt. Using a spoon to mix, combine ingredients without kneading. 6. Refrigerate dough for 30 minutes. 7. Mix shortening and butter in bowl. 8. Roll dough into 1/4 inch thick rectangle then spread with half of the shortening mix. 9. Fold an edge over the middle and spread the remaining shortening on this section. Then fold over the last section and roll dough to thickness of a 1/4 inch. Fold into thirds and roll again, repeat, then refrigerate overnight. 10. Roll dough to a thickness of 1/2 an inch and then cut into rounds of 1 1/2 inches. 11. Place a spoonful of meat mixture on one side and fold over the other side, pressing the ends together. 12. Place on baking sheet, brush with egg yolks and baked in oven with a pan of water on the rack below at 4000 F for 30 minutes. Turn oven down to 3000 F and bake for another 20 minutes or until patties are golden brown. 1)	Juice the lime and set juice aside. 2)	Clean chicken pieces with the squeezed lime then rinse in cold water and use paper towel to pat the pieces dry. 3)	Combine chicken and parsley, black pepper, garlic, thyme, onion powder, scallions, reserved lemon juice, salt and pepper, then marinate for two hours (preferably overnight). 4)	In a heavy pot, add chicken and let stew on medium flame for 15 to 20 minutes, stirring occasionally. 5)	Boil cashews in a separate pot in water until cooked halfway. Drain and set water aside as well as cashews. 6)	Empty pot of chicken and its juices, then add oil and tomato paste to the pot while stirring. Cook tomato paste for a few minutes and add chicken to be browned all around, stirring constantly to avoid sticking. 7)	Add tomatoes, bouillon, onions and hot pepper. Cook for five minutes then stir in cashews, adding water from cashews as necessary. 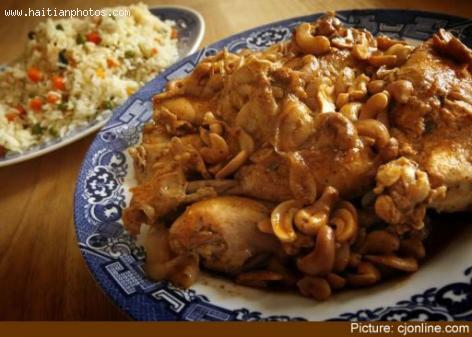 8)	Cook for a half hour or until chicken and cashews are cooked. Season with salt and pepper and serve hot. Enjoy this tasty cornmeal dish hot and with sliced avocados on the side. 1)	Soak kidney beans overnight in 3 cups of water. 2)	Drain the next day and cook in pressure cooker with enough water to cover beans until they are tender. You may use a normal pot to boil the beans if you don't have a pressure cooker. Just add another cup of water and cook on low heat for an hour to an hour and a half. Then, separate beans from the liquid, saving both. 3)	In a mortar, grind all spices together with a pestle. 4)	Heat the oil in a deep, heavy pot and sauté the booked beans with the ground spices and onion for 5 minutes. Stir in coconut milk, salt, cloves and the water from the beans and bring to a boil. 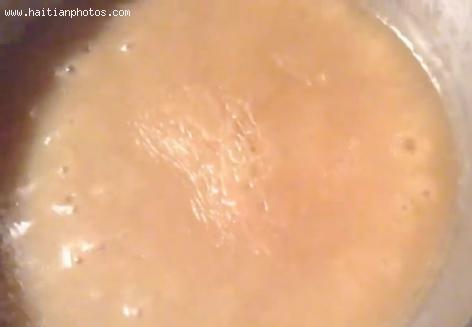 Stirring vigorously to avoid lumps, add cornmeal to the mixture. 5)	Stir regularly while cooking for 40 minutes along the side of the pot with a wooden spoon to prevent sticking. 6)	Add salt and pepper to tast. An extremely popular Haitian dish, usually served with fried plantains (Bannan Peze) is Griot. This is pork shoulder, cubed, marinated, boiled and then fried to golden brown perfection. 1. Mix into a paste the hot pepper, onions, thyme, shallots, cloves, garlic, parsley and paprika with a tbsp. of lime juice. Set aside. 2. Use the remaining lime halves to clean pork and rinse with cold water. Then, in a medium-sized bowl, use hands to mix paste, pork and orange juice together. Cover and let sit in refrigerator for 45 minutes to up to a day. 3. Add pork with water to pot and boil until tender (for about half an hour to 45 minutes). Drain. 4. Heat oil and fry boiled pork pieces until crispy (for a healthier option, one may bake the pieces at a high temperature until golden brown. 5. Drain on paper towels and serve with Fried Plantain, rice and pikliz. Of note: the remaining juice after the boiling of the pork may be used to make a sauce to accompany the dish.